In order to keep Catholicbible101 on-line (yes, it does cost money! ), I have decided to start selling a bible study that will walk the student through the entire bible historically, from Genesis to Revelation. Most people don't have time to read and study the bible, and a lot of people get confused regarding the story of the Jews and how it relates to Christianity today. This series will give the time-challenged Christian biblical insights into the history of God's people, and the hidden theology behind events in the bible. In just minutes a day, you will learn more about the Bible than most people will ever know. Please remember that Catholicbible101.com is a one-man show, and it does cost me $$$ to keep it on-line. 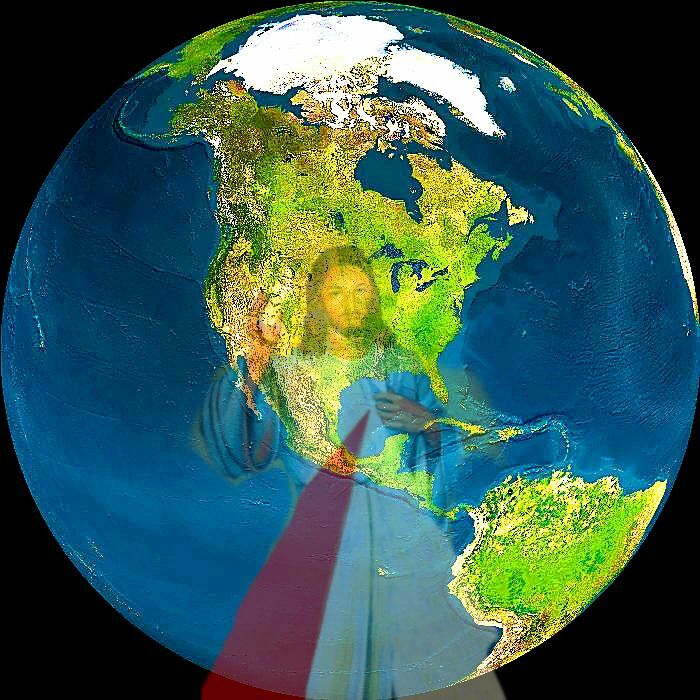 By purchasing this digital download, you not only gain biblical knowledge that most people will never know, you also help me to evangelize a world gone mad, with rampant atheism, militant homosexuality, and lukewarm Catholicism seemingly taking over people's minds and hearts. The bible study will be in a series of slides (pdf format) with an overview of the history of the Jews in the Old Testament, as well as an overview of the Christians in the New Testament. The slides will contain hyperlinks to additional sites if the student desires additional information. And if you apply the knowledge learned in this study to your personal life, I can assure you that IT WILL CHANGE YOUR LIFE FOREVER. There will be 13 sets of slides, one for each era of the Bible + a slide on the history of the bible and how to read the bible, and if you don't know what the 12 eras are, you have come to the right place. Each set of slides will vary in the total number of slides, depending on the amount of history and the underlying theology for each era. Each set will sell for $1.99 each. $1.99 is very inexpensive for the amount of knowledge you will gain. $1.99 is cheaper than a king-size soda at the hamburger place, cheaper than a gallon of gas, and cheaper than a rented movie. So if your priority in life is to learn what God is trying to tell you in his love letter, the Bible, please consider purchasing each set of slides. You won't ever regret it, and as a bonus, when a protestant comes up to you and tries to bedazzle you with his/her knowledge of the bible, YOU will be able to hold your own while he or she is trying to get you to join a "bible church." Catholics DO NOT read the Bible like protestants do. Learn about the 4 ways to read scripture, how the bible came to be (it didn't fall down from heaven in King James' lap! ), and learn about biblical typology. 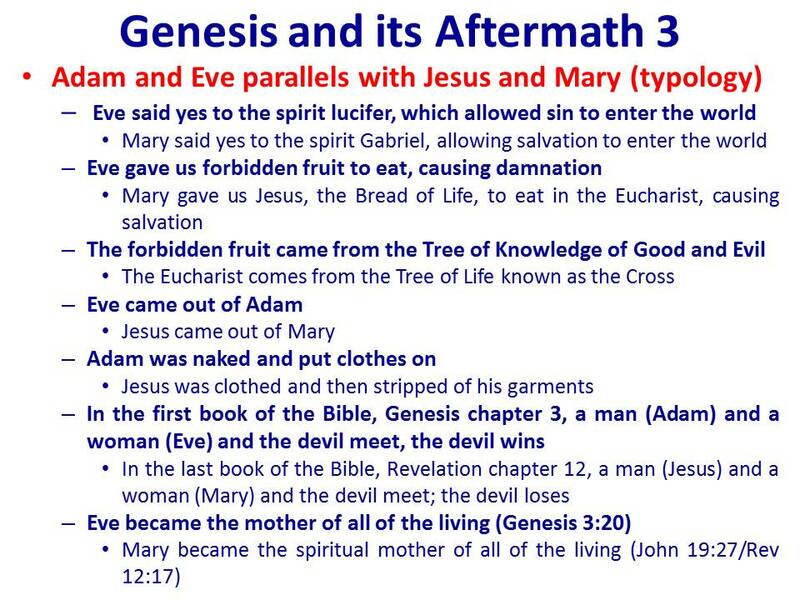 Lesson 2, "Genesis and Its Aftermath"
To understand the New Testament, you must understand Genesis. This lesson tells us all about the parallels between Adam and Jesus, Eve and Mary, who the first "mighty man on earth" was, who carries the seed of God's blessing, why death entered the world, the role of Noah, and why the Tower of Babel is a precursor to Pentecost in the New Testament. A MUST READ! Please click on the "Add To Cart" Icon below! 14 slides, with hyperlinks for more information (a LOT more! ), only $1.99. Learn about the 4 Patriarchs who carried the blessing of Shem forward through time. This lesson is very important in understanding how God deals with the self-reliant and clever tricksters of his people. And in the end, the good guys win! This summary of the latter part of Genesis will save you hours of having to read through the bible, and will not only inform you of the history, but will go into the lessons learned for us all. $1.99 for 18 slides. This lesson discusses what happens after Joseph dies, and the struggles Moses had with Pharaoh. The hidden meaning of the Passover meal and its eternal implications to modern day Christians is brought to light. The great Exodus begins to the Promised Land! $1.99 for 9 slides. Lesson 5, 40 Years in the Desert, Coming Soon!